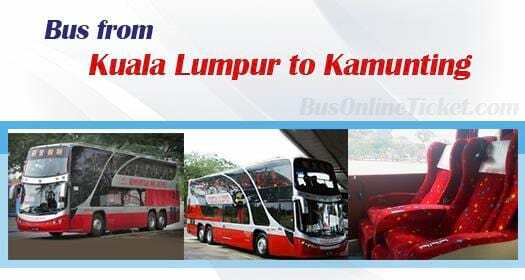 Bus from Kuala Lumpur to Kamunting is most convenient bus service to travel between the two cities. This bus service is important to many people especially working adult and students who usually travel back and forth from their hometown on weekend. Train only stops at Taiping Train station, which is some distance away from Kamunting. This results in inconvenience for passengers going to Kamunting. As compared to train, bus to Kamunting service provided by Konsortium Bus Ekspres terminate at Kamunting. Passengers alighting at Kamunting do not require additional transfer service. Konsortium Bus Ekspres is the one and only bus operator who serves bus service from Kuala Lumpur to Kamunting on daily basis. They provide total 23 daily departures from morning 7:45AM until night 11:10PM. It is almost on hourly basis, there is a bus leaving from Kuala Lumpur for Kamunting. The duration required for bus from Kuala Lumpur to Kamunting takes about 4.5 hours depending on the road traffic condition on your departure day. One washroom break will be given during the journey. The bus fare from Kuala Lumpur to Kamunting offered by Konsortium Bus Ekspres is reasonably charged at RM 27.00 for adult and RM 20.40 for child. The pick-up point in Kuala Lumpur is conveniently located at Terminal Bersepadu Selatan (TBS) or Hentian Duta Bus Terminal depending on your selection of pick-up point. The arrival point in Kamunting is at Kamunting Bus Terminal. Everyone now can book your bus ticket online through the most reliable and trustworthy online ticketing portal BusOnlineTicket.com. Even though there are frequent bus service from Kuala Lumpur to Kamunting, passengers are advised to book your bus ticket in advance especially for weekend and peak season departure.